Guys. This one almost broke me. I can’t really overstate how much time and effort I put into this entry – over six months of preparation and research, visits to at least twelve different Asian markets in three boroughs and a few on the internet, countless informational favors from friends of friends (of friends) and even (unanswered) emails to the Embassy of Brunei in Washington, D.C. and the Brunei Board of Tourism – just sayin, I really, really hope it was worth it. Though Brunei sits on the world’s third-largest island, you’d never know it from the paucity of specifically Bruneian ingredients in New York City. It was very important to me that, for this entry, I highlight a dish that was unique to Brunei. See, its proximity to other countries in Southeast Asia – especially Malaysia and Indonesia, with whom it shares the island of Borneo – causes most people to assume that Brunei’s food culture is simply an offshoot of these of other sovereignties. This may be true to a large extent, and especially so regarding other Southeast-Asian Muslim countries, but there is indeed a dish found in Brunei that is found nowhere else, and this is exactly what we are going to make. Now, ambuyat on its own has no real flavor – it’s just, well… starchy, kind of like a bland, free-form noodle. This is where the side dishes come in. Ambuyat is meant to be served alongside a variety of dips, condiments, meats, soups and greens. 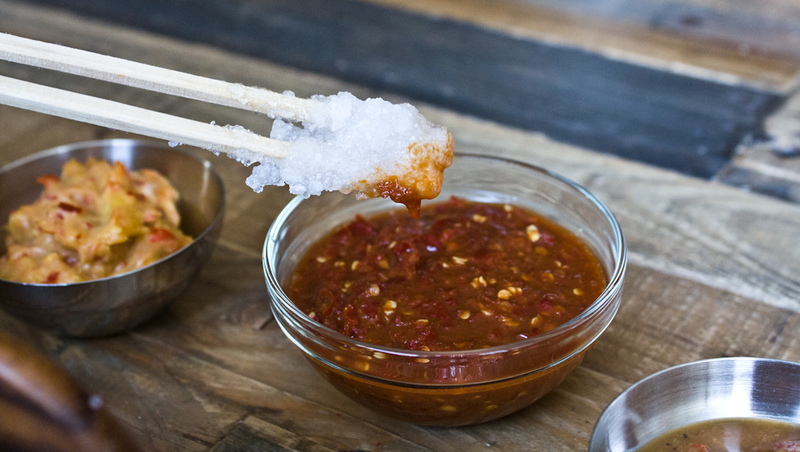 It’s also NOT supposed to be chewed – you’re obliged to use your candas (“chan-das”, a special two-pronged bamboo stick) to twirl up some of the steaming hot goo, dip it in one of the condiments (cacah, pronounced “cha-cha” [NB: I stand corrected, it is pronounced “cha-cah”! – MR]), and then swallow the lump whole. I assume lots of tourists choke on ambuyat. After looking at a lot of pictures of ambuyat spreads and reading numerous travelogues involving this dish, I decided on three condiments, a veggie and a soup, all representative of a typical ambuyat meal. 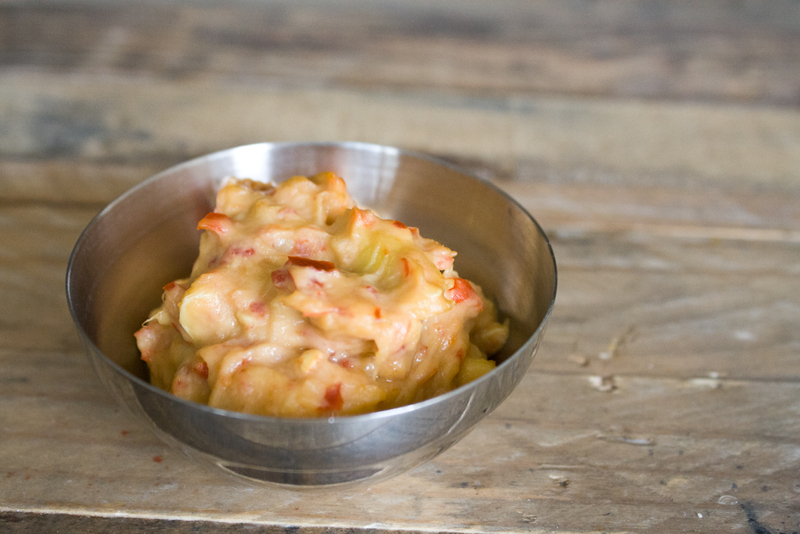 Let’s start with the most formidable of these condiments – sambal tempoyak, a fermented durian sauce. Wait, did you say “durian”? FERMENTED durian?! Musang King durian (Durian Kunyit), not-so-fresh from Malaysia by way of Chinatown and probably a huge steel storage container. 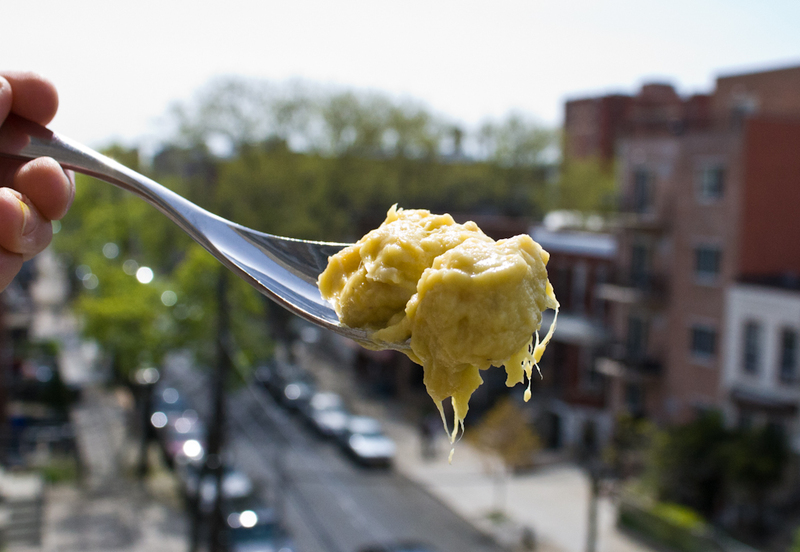 Durian’s flavor is not really the insipid horror that it’s so often made out to be. (NB: if you’ve never heard of this fruit, you should really read the wiki on it as a primer.) It’s not a taste that I am at all fond of, but after two encounters with this spiky plant I am beginning to understand how some find it to be very appealing. There IS a sweetness buried under its dizzying funk – something not unlike an overripe papaya mixed with rotten onions in a hot dumpster. I have no explanation for this, but the sense memory that most readily springs up for me when I taste durian is actually the pink amoxicillin syrup I had to drink by the tiny-plastic-cupful when I used to get strep throat as a kid – medicinally sweet, cringe-inducing and imbued with reluctance and a little fear. I also taste boiled egg. If you’ve ever tried to thoughtfully tackle a really runny, pungent French cheese that reeks of a barn, you’re getting the idea. To say it’s an acquired taste is a drastic, abhorable understatement. But there is nothing else like it on earth. The real issue with durian, I think, is that it’s just so AUDACIOUS. Durian is that guy at the party who is incessantly jingling change in his pocket, excitedly slapping everyone on the back WAY too hard and eventually, I don’t know, breaking the bathroom door by accident or something. He’s not subtle at all, and even though deep-down he’s probably a really nice guy and just wants approval, everyone’s always like “ugggghhhh durian is here…” There is no “Durian Lite” – the volume knob is always at 11. 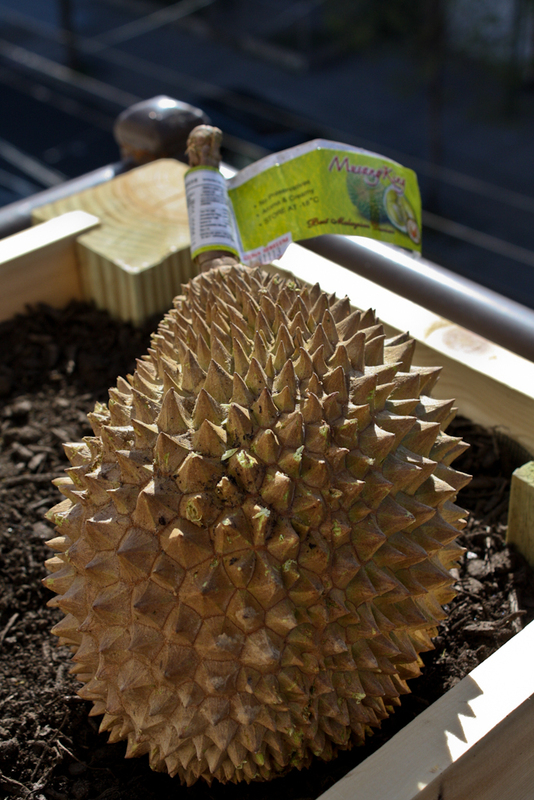 The poor durian’s problems stem partially from its complex profile of volatile compounds – lots of sulfur flavors and esters. Notable among these are ethyl acetate (which carries a smell that many would recognize as nail polish remover), benzyl alcohol (which is present in jasmine and some teas, but also in commercial wood laquer) and, after sitting for a while, ammonia. 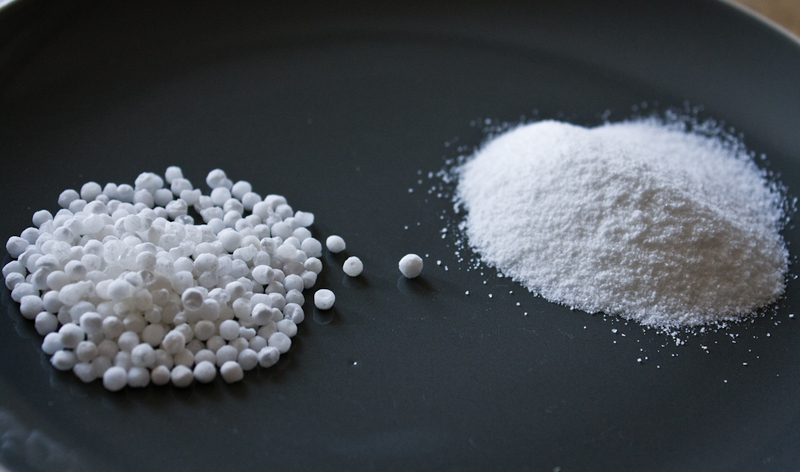 Another issue for those of us in the West – as the fruit ages during shipping, the ester compounds that provide sweetness break down, while sulfur content remains stable and benzyl alcohol content increases. 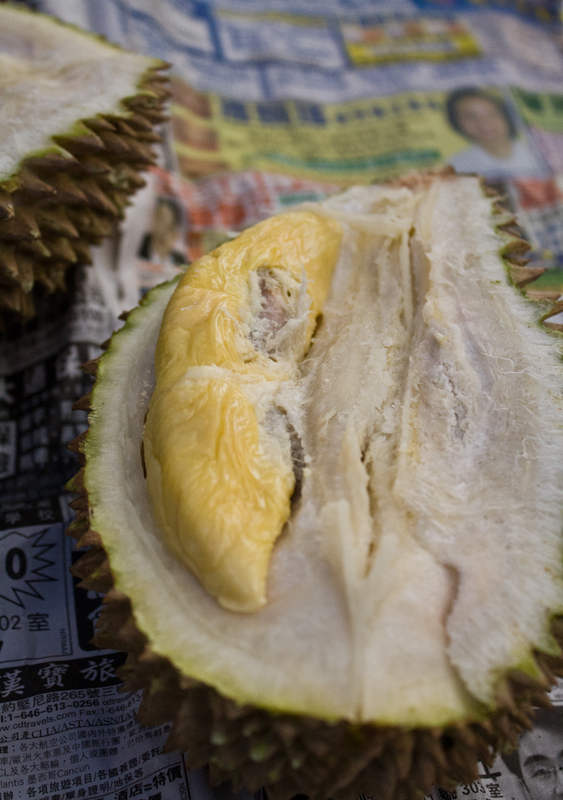 All this means is that the “off” smell of a durian gets worse the longer it takes to get from Asia to your nose, and unless you taste a durian close to its harvest chances are you’re really only getting a stank, aged, overripe version of it. Couple that with its stringy, mushy texture and it’s knifepoint-sharp spikes and you have a recipe for wholesale character assassination in the West. It’s just criminal. Take everything I said about durian up to this point, and multiply it by six. Then add more onion and egg. That’s tempoyak. Obviously durian is not the only ingredient in Bruneian cuisine. Like its neighbors, Brunei has an affinity for other Southeast-Asian ingredients like birdseye chilies, shallots and belacan, a roasted, fermented shrimp paste that comes in the shape of a brick. 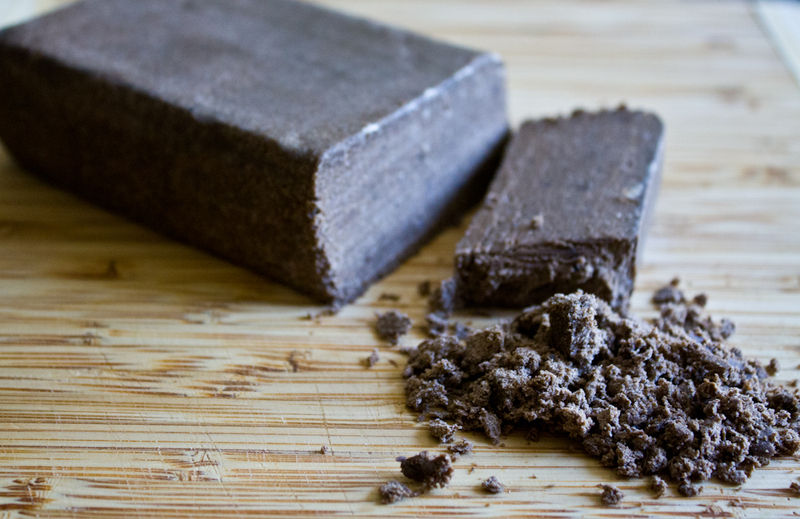 The flavor of belacan is also hard to describe, since its odor and its taste are so different from each other – to my Western nose, it smells of fresh, wet soil. Taken alone (which is almost never done), it tastes of bitter ocean water. Regular eaters of belacan say that it imbues food with an indescribable flavor, like the umami of Far Eastern cuisine (which has so recently become such an irritating and anemic buzzword in the U.S.) It’s what belacan does to other ingredients that defines its role. A quick word on that last one – first off, nobody told me that cencaluk was carbonated (edit: not true, the wiki says it. I’m just dumb.). 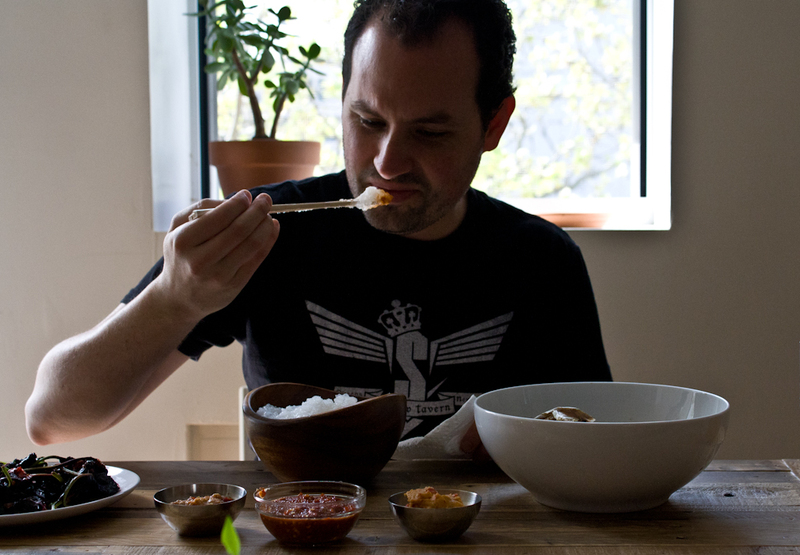 It’s just salt-fermented/pickled udang geragau, the same tiny shrimp/krill that are used to make belacan. No big deal, right? It came in what looked like an old-school soda bottle, complete with a metal bottle-cap that depicted a cartoon shrimp on it. That shrimp was the last thing I saw before my face, my arms, my chest and part of the ceiling were coated in a heterogeneous veil of aged, semi-liquid shellfish. The bottle-cap had rocketed into another room, and the aroma surrounding me was something like cat food or semi-digested tuna sandwich. Which, if you think about it, is sort of what cencaluk is – sea creature that has been coaxed into an intermediate and retarded state of putrefaction, allowing the volatile compounds within it to merge, disintegrate and recombine into new flavors, odors and colors. Not really all that different from a lot of stuff eaten in the West – wine, beer, prosciutto, sauerkraut, yogurt, pickles… It’s really just the fishy angle on fermentation that freaks us out, since our exposure to it is usually minimal. And by “minimal” I really don’t mean a cup-and-a-half of it violently shot at my face. 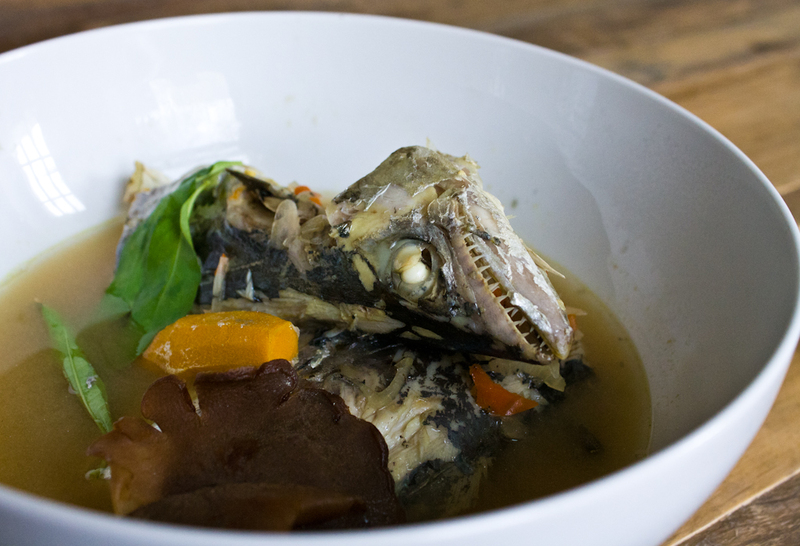 OK, we got these sambals pretty much on lockdown, so let’s move on to the main course – ikan kembung asam rebus, or “sour mackerel soup”. Again, I’ll need to introduce a few out-of-the-ordinary ingredients. 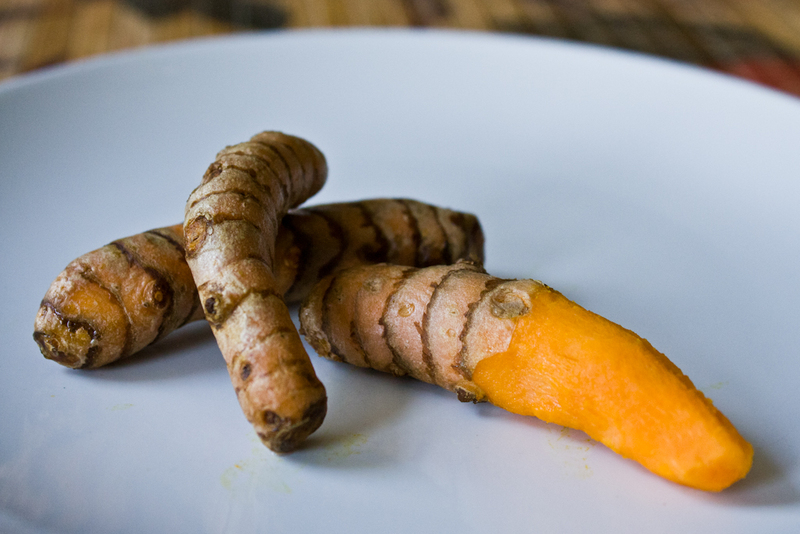 First we have fresh turmeric root, which is integral to many cuisines of the East and has very recently become quite the vogue in dietary supplements and as an additive in those heavily-marketed health drinks. Studies are showing that turmeric root touts vigorous anti-cancer properties, and it has an clean, astringent, nasal taste that is very unique. 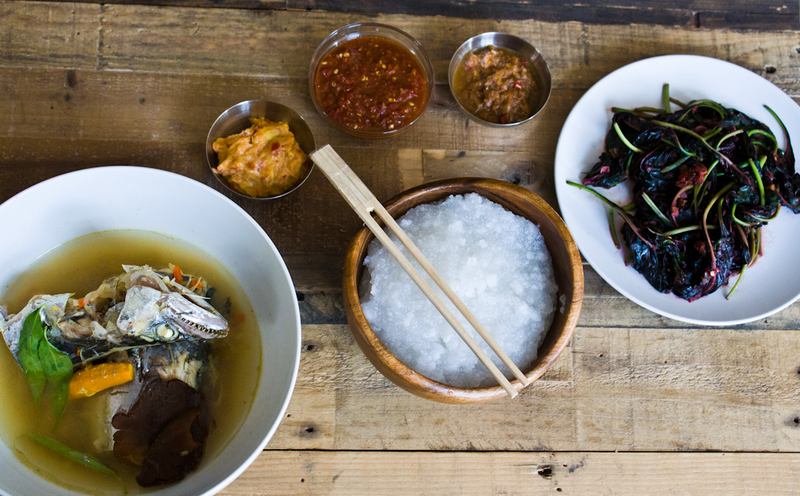 In this soup its main role is to reinforce the “sour” aspect against the fattiness of the mackerel, along with another strange product, asam keping. Asam keping are dried slices of a Malaysian rainforest fruit that is know botanically as garcinia atroviridis. This fruit is SOUR. Like, short-guy-passed-up-for-promotion-to-manager sour, or quadruple-divorcee sour. Trust me, I chewed on a piece and my face involuntary imploded into a fleshy singularity. To make the soup, you just toss a few pieces into the pot along with the turmeric, chilis, more belacan and mushed-up shallots, and a nice, slender mackerel, hacked in half. Oh, and water. 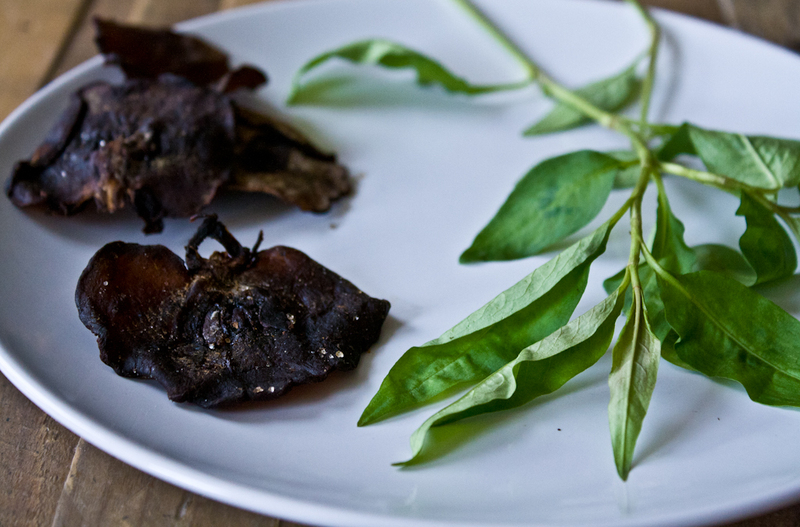 To finish this dish, you sprinkle on a little daun kesom, which has a grassy flavor that is kind of like mint but also kind of like something else. The Vietnamese superstition is that daun kesom (or rau ram, in Vietnamese) suppresses sexual urges, though with the breath you’d have after eating this I really couldn’t imagine anyone being in much of a mood for the horizontal mambo anyway. 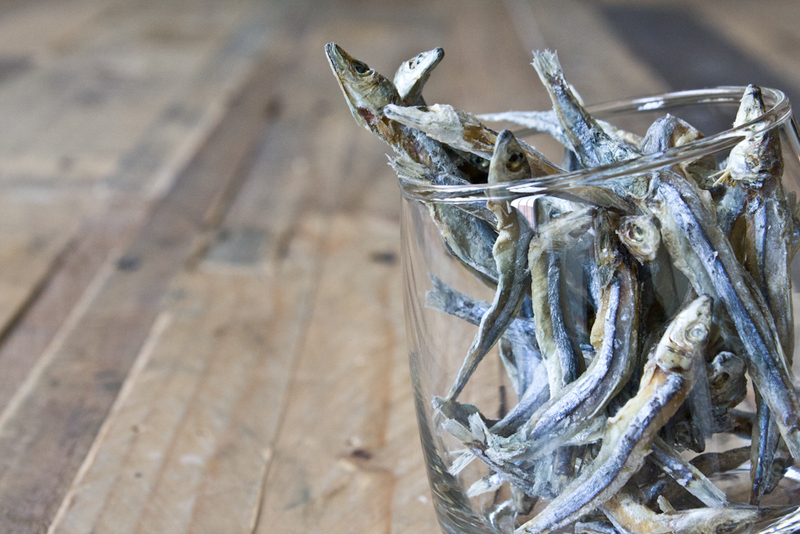 First, some dried anchovies – the same salty fishies that Asian fish sauce is made from! These are to be pounded in a mortar along with the requisite shallot and chilis, and even a little garlic this time. You take this paste now and saute it along with gorgeously-hued sayur bayam, a sneaky name for the by-now-familiar amaranth. Before I started this blog I had no clue how freaking common amaranth/callaloo/borogo/imbuya/bayam is in the world diet – it grows almost everywhere, and pretty hardily at that. 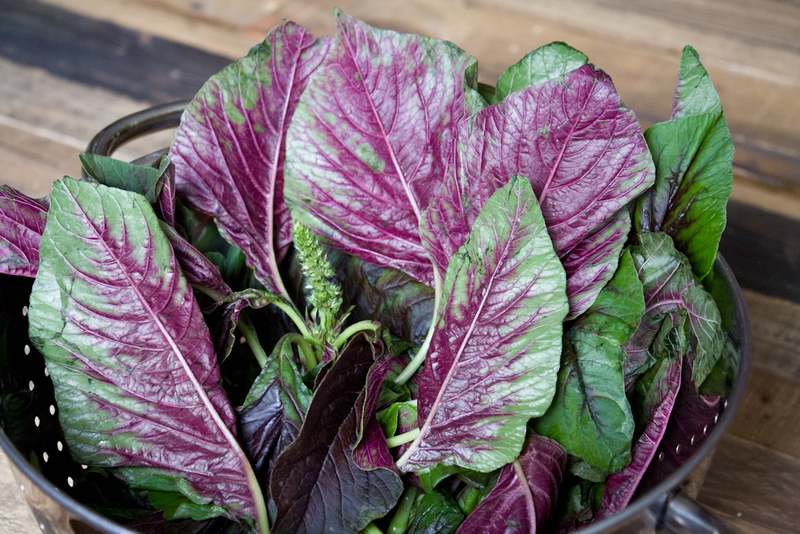 The name amaranth comes from the Greek word for “undying”, which maybe explains its popularity, if not its ubiquity. As this cooks, it actually smells a lot like an Italian dish I know very well – escarole braised with anchovy and garlic. Finally, a moment of recognizable comfort after spending so many hours wandering with no map (and no GPS). And so here were are, friends. The hour of reckoning, after so much planning, grimacing and exploding shrimp guts. With no small measure of anxiety I poured boiling water into a large bowl and whisked the ambuyat with all of myself. I couldn’t get the powder ground as finely as an industrial machine could, so it came out a little clumpy, but still far better than I had expected. I also made myself some makeshift, MacGruber-style candas by snapping and then taping together some chopsticks from the Chinese restaurant down the block. I want to be honest – I’m sort of struggling with how this entry has played itself out. I really wanted to give Brunei a fair shake, and I think I have done that at least through my methodological diligence. The one major setback here has been my palette. I am what I’d consider to be an open-minded eater, but for the first time in a very long time I have found my gastro-cultural foundation to be… inadequate. I have never before tasted flavors so foreign to me, or smelled smells so contextually confused – what others, somewhere else, celebrate and crave has made me recoil, wince, shake my head with panic, “NO!”, while eons of evolved neurological defenses strongly suggested I not allow what was in my mouth go any further into my body. Like an unholy inversion of Proust’s madeleine, a celebrated condiment recalls the taste and smell of tuna-sandwich vomit; a much-loved soup, sniffed with closed eyelids, brings up only sense memories of dumpsters and soil; and a life-saving carbohydrate conjures only the faintest apostate recollection of masticated communion wafers. Can this be right? Is this what these foods are supposed to taste like? How can I know if I made a mistake?? What else can I say? Brunei, it’s not you, it’s me. I’ll get there, I swear. – The dip that accompanies ambuyat is pronounced “cha-cah”, not “cha-cha” as previously explained. – Binjai is apparently NOT necessary to make a proper cacah! – The belacan that I used is possibly the wrong regional type – rather than the chalky brick version, it has been suggested that I instead use what I can only assume to be petis udang, a stickier, fresher-looking version. – Ambuyat is apparently also found in Maluku, Indonesia and Papua where it is known as papeda. Mix well. Store in an airtight container for 1-2 weeks. Eat. Will keep in the fridge indefinitely. Whisk boiling water into a large bowl containing the ground sago starch. Continue to whisk until it sets. Serve with sambals, using candas. Pound the shallots, garlic, chilis and ikan bilis in a mortar. Saute in a little neutral oil until fragrant. Add the amaranth and continue to cook until tender. Serve. Clean the fish and cut it to fit the pot. Pound the chilis together in a mortar until smooth. Top the fish with the pounded chilies, asam gelugor, turmeric and water. Let it boil and add the daun kesom and salt. Cook about 20 minutes or until the fish is flaky and cooked through. Serve hot! 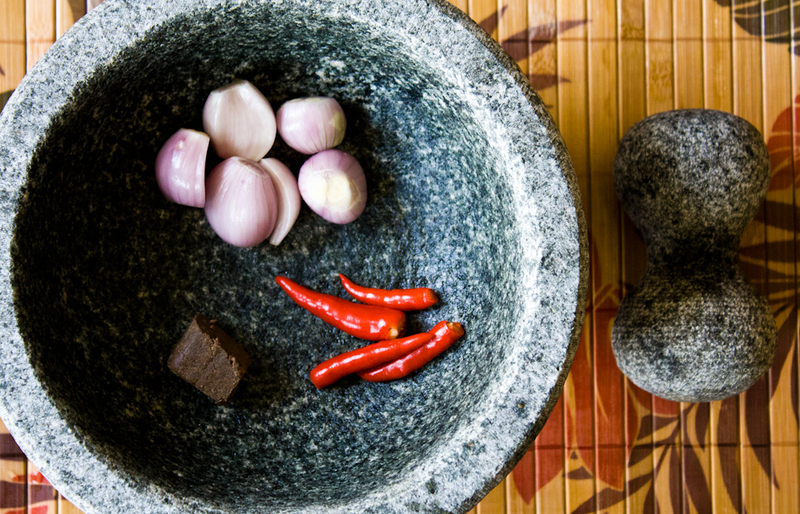 Pound the chilis and belacan in a mortar. Mix well with tempoyak. Serve at room temperature. I can’t wait to make this never. This is . . . epic. Bravo. your ambition for authenticity is admirable. i love new posts n_n looking forward to bulgaria. I truly commend your effort on this dish/country…but no thanks:) I do love the photography and editorial. It’s raining cats and dogs as I type here in my cold, cold office in Brunei. Sure brought a massive smile on my face!!!! I do hope you visit Brunei one day 🙂 You don’t have to eat ambuyat though!! haha! I am from Brunei and I applaud your efforts! Even as a Bruneian I have never made the effort of making my own ambuyat and cacah (it’s pronounced cha-cah not cha-cha btw!). Very impressed with your research and determination to complete the dish! Being Brunei pruned and bred, this article really puts me to shame as you’ve ventured out and made known to me the history behind ambuyat. Fermented durian with ambuyat is not really one of my favorites but you should really give mango a try. You don’t necessarily need bin jai mangoes to go with Ambuyat. The typical thai dok mai mangoes that is easily available would serve the same onus though you get less of the sour kick to it. Or perhaps you could try the thai green mangoes as a substitute. But again it really runs down to your policy of sine qua non. Looking forward for future posts on Bruneian cuisine. 🙂 Feel free to drop me an email if you do need help in the future. Hey there! 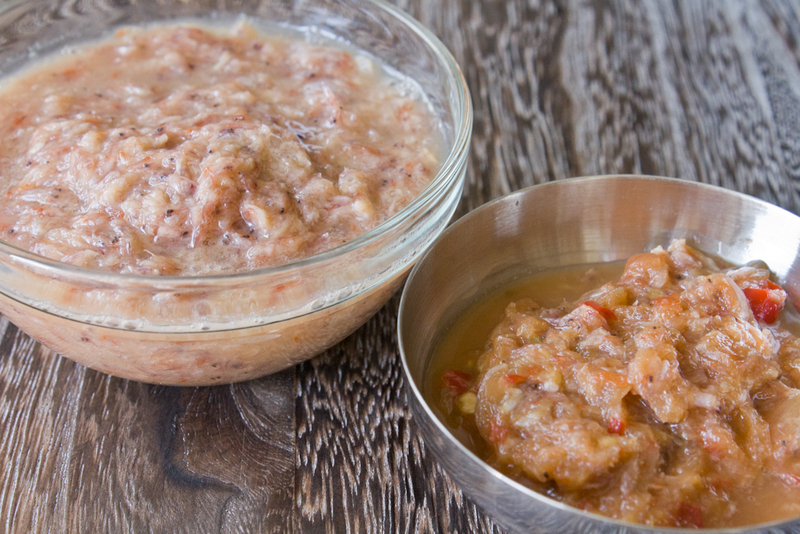 Binjai is the main component in the cacah to blend well when the ambuyat is dipped in it. And i think what alters the taste of your ambuyat and its condiments is that, in Brunei, we hav our own belacan which isn’t as hard as malaysian belacan according to your shot up there. Ours is quite.. Sticky and freshly extracted looking and neatly packed. And what comes from different countries doesnt usually taste and smell similar. And for the ambuyat, we whisk while we pour boiling water in it, but not too vigorous. We don’t use the boiling water from boiling dispenser. Usuallywe heat water on the stove or use the domestic kettle to help trigger the whisk so theres no crumpled ambuyat even though sago is unsifted. And in Brunei, some igredients come in handy as industries process and make paste out of them. But usually we just get all the ingredients from any convenient stores as theyre not very hard to reach. I am not sure about the cencaluk as well as the step that involved durian in it. Speaking of the durian, its a well known fruit in Malaysia and Brunei and there are two types of it, one is Durian putih (white durian. I think thats the one ur using. Its quite white yellowish) and another one is durian kuning (yellow durian. Usually it is orangey or slightly red.Usually we can tell the color of the fruit inside from the outer skin though) in my case, i agree with ur description on the durian. However ive tasted both durians and yellow durian is tastier and no taste of ammonia-ish or chemicals combined and doesnt make u feel nauseous & whatnots like white durian.. Yellow durian is quite seasonal and when its available in both countries, i much prefer buying from Malaysia and buy double/triple sets(one set hs 4-5 durians depending on the size) with te price of a set of durians in Brunei. And no, not everyone in Brunei likes Ambuyat as much as italians that are very fond of ravioli. I’m never fond of it myself. We hav less than 20 eateries here that provide ambuyat in the menu. Not much out of all eateries in Bru but when they do, its too costly to pay(usd25-40 for 3-5 pax) compared to whisking their own ambuyat at home(less than usd15 for 3-4 pax) If you ever consider visiting brunei, usd1000 is more than enuf in a week or two for food tasting and being the real tourist as you’ll be when youre here. Usually they come during the week of national day (23rd feb) as thats when all bruneians come out celebrate and witness the royal families. Hi Mark. I believe you would want to know more of our culture and the treasures behind it too, besides the food. Try visit our website “Mingguan Brunei”. It’s a new magazine covering different aspects of life, culture, the people, interesting places like recreational parks, home stay and many more. Mingguan Brunei specialty in reviving the history and such like discovering the more than 70 different species of herbs found in Brunei. Do visit Aminah Arif Restaurant. They serve the best Ambuyat dishes in town. Your “ambuyat” looks like it was prepared wrong. Its not supposed to look grainy and hard. I confess, ambuyat preparation is extremely difficult, I have tried many times and could not the right texture. It takes a lot of experience and more importantly, perfect timing. Have you tried these dishes in Brunei yourself? I very much appreciate your audacious attempt at making our local cuisine.. cheers! I truly admire your zeal, I couldn’t have done better under similar circumstances. I’m a Bruneian and I never would have thought of using ground sago pearls as a substitute for “ambulong”. And to use one of the most expensive variety of durian to make tempoyak leaves me speechless. I can’t imagine how much this cost you to put together. A correction though, ambuyat is also found in Maluku, Indonesia and Papua where it is known as Papeda. An american chef friend of mine experimented with the tempoyak as a marinade, which I tried to replicate, and it actually worked well http://august13th.wordpress.com/2010/10/27/tempoyak-grilled-chicken/ You’ll see the same tempoyak product here that exploded into Maurina’s face. The ambuyat is a love-it-or-hate-it dish. It’s quite simply tasteless goo. But with the right side-dishes, it’s wonderful. Having said that, I have only ever once attempted making ambuyat. Finished a whole bag of sago (ambulung) that would have made 10 servings, and still didn’t get it right. I’ve not tried since! So your attempts, although bordering mad, are really impressive. Come over and have the real thing! With the proper side dishes, ambuyat can be an experience to savor. If you happen to be in this part of the world, I am sure many of us would bring you for an authentic experience. Thanks you so much! Yes, the durian cost about $15 US, and it only made about 1 cup of tempoyak… but since this is something I will probably only make once I figured I would go for the best! I have to say that you are one of the most determined human being to attempt ambuyat without the necessary ingredients at your reach. That said you should come to Brunei so we can treat you to a proper spread of ambuyat here old school family style away from the restaurants so that you can have authentic ambuyat. Ana, I will definitely take you up on that offer if/when I visit Brunei! What a nice offer, thank you! 🙂 There is nothing better than a home-cooked meal with great people! Thank you so much for the kind words, I appreciate it! This is amazing! I fell upon this blog via your Bolivian post hoping to find something to wow my own Bolivian husband. Somewhat of a culture-vore myself I am very impress and excited for this blog!! Keep it up! I can’t wait to see the rest of the world through food.